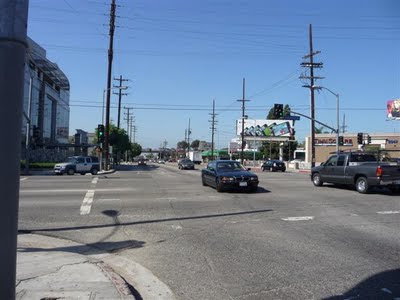 Experiencing Los Angeles: Pico and Sepulveda: an Intersection, a Song, or a Couple of People? Pico and Sepulveda: an Intersection, a Song, or a Couple of People? 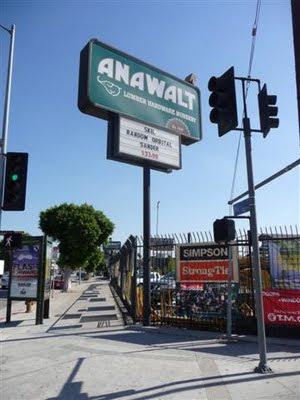 A trip to the local lumber yard normally would not warrent a blog entry, except that Anawalt Lumber is located at the corner of Pico and Sepulveda. 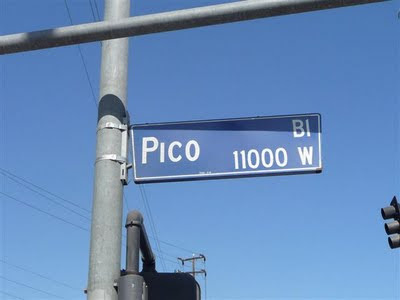 Pico Blvd travels east - west from downtown Los Angeles to the Pacific Ocean 16 miles away. Sepulveda Blvd travels north - south from the edge of the San Fernando Valley to Long Beach. At over 42 miles, it's the longest street in Los Angeles. 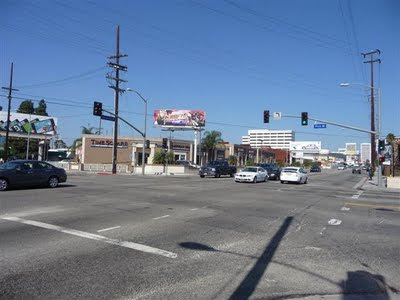 Looking northwest: as you can see, there is absolutely nothing unusual to see at the intersection of Pico and Sepulveda. 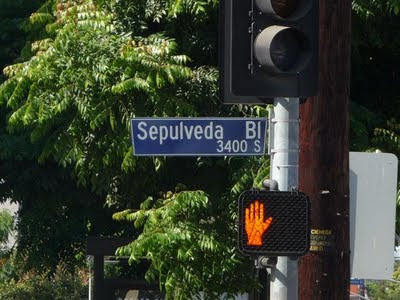 However, this being Los Angeles, the 1947 song "Pico and Sepulveda" by bandleader Freddy Martin took an obscure interection ... and turned it into an obscure song. That is until Dr. Demento (a locally based DJ featuring off beat, odd, and humerous songs) made it a regular staple of his nationally syndicated show. Pico and Sepulvdea (the song, not the intersection) actually has a catchy little tune. 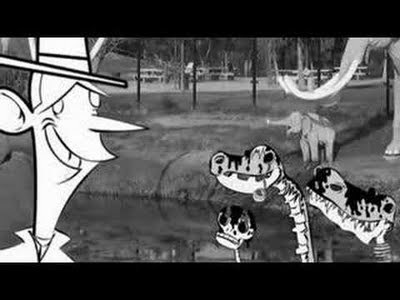 It was featured a a 90 second clip from the 1980 film "Forbidden Zone" (1980). A search on YouTube yielded another - actually more entertaining - version of the song. 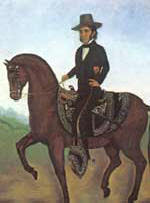 My kids like this rendition of of "Pico and Sepulveda" even more: http://www.youtube.com/watch?v=D98BR1DYrkg. The song celebrates various place names in Los Angeles - many of which are mispronounced by visitors or new comers. 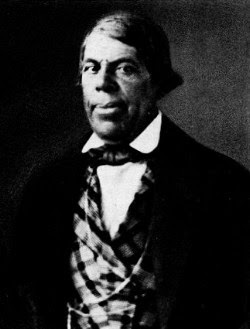 Sepulveda (again, the person, not the street) was Francisco Sepulveda (1775 - 1853) a member of the influential Sepulveda family. Back at Pico and Sepulveda, this time looking west on Pico towards the San Diego Frwy. The individuals may be interesting, the song may have a catchy tune, but unless you're in need of some lumber or something across the street at the mini-mall, Pico and Sepulveda is not a destination. In another L.A. moment, I noticed a double decked tour bus at the intersection. The add for the HBO ad "Bored to Death" seemed to take on a double meaning. No doubt those out of town guests are asking themselves: "why are we here?" Hopefully, on their way to the beach. i remember that song from dr demento - is he even on anywhere?? DR DEMENTO, YEAH! I REMEMBER LISTENING TO THIS SONG BACK IN THE DAY! Used to listen to the Good Doctor on KMET-FM and KLOS-FM whilst attending USC in the early 1970's.